Hollywood on the Potomac: CNN’s Ed Henry on Branch Rickey Washington Life columnist Donna Shor discusses Branch Rickey’s decision to sign Jackie Robinson for the Brooklyn Dodgers with CNN Senior White House Correspondent Ed Henry. 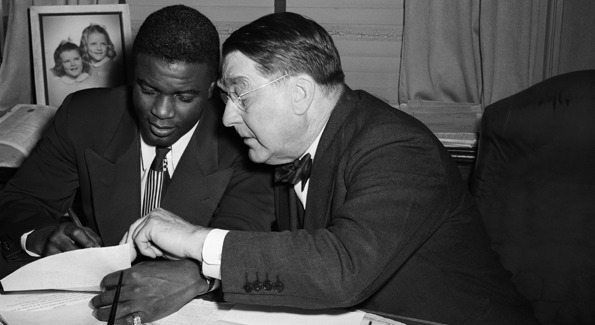 January 24, 1950 - Jackie Robinson signs a contract with Brooklyn Dodger's team president Branch Rickey. Image by Bettmann/CORBIS. Washington Life columnist Donna Shor discusses Branch Rickey’s decision to sign Jackie Robinson for the Brooklyn Dodgers with CNN Senior White House Correspondent Ed Henry. Blog contributor and Washington Life columnist Donna Shor was interviewed last week in a story by CNN Senior White House Correspondent Ed Henry on Branch Rickey’s decision to sign Jackie Robinson for the Brooklyn Dodgers. Rickey made the decision in the presence of her father-in-law, Rev. L. Wendell Fifield, a minister at Plymouth Church of the Pilgrims in Brooklyn Heights. Donna Shor. Image by Janet Donovan. Ed Henry, who’d heard about it from Donna Shor a couple of years ago, also recognized its importance. He remembered the story and asked Shor to talk about it for the segment, which included interviews with Rachel Robinson, Branch Rickey III, and Ken Burns. CNN White House Producer Jamie Crawford helped put together the segment and wrote a blog about the story. Friday marked the sixty-fourth anniversary of the day Jackie Robinson made his major league debut with the Brooklyn Dodgers, breaking the color barrier. Ken Burns is doing a program on Jackie Robinson that will come out in 2015. Another Robinson movie in the works: Robert Redford has recently announced that he is going to play Rickey in a film about the relationship between the two men.